In my view, there would not be more rate hikes in the US. They will probably cut rates and it will be followed probably also by negative interest rates, whereby we have to considerate an election year. Maybe they have some, let us say, reluctance to cut rates to below zero in an election year. So it could be interpreted as a political kind of maneuver but anyway my view is before the end of this year we have QE4. .... the thing is in 2004, they started to lift the Fed, from rate from 1% to 5.25% in August 2006. They cut the rates after September 2007 again to zero percent essentially in December 2008. So, in December 2008 to December 2015 we had a period of essentially zero interest rate. The economy in the US was actually expanding at quite healthy rate in 2010, 2011. That is when the Fed should have increased rates. But no, they kept rates at this artificially low interest rates until December 2015, three months ago. 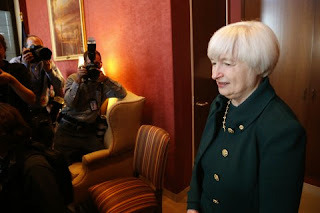 My view is Ms Yellen, she will have huge portrait in the museum of great financial errors, because she increased interest rates exactly at the time the global economies entering a global recession.